Generous Australian friends gave us this handsome hardcover title as they know we are going to be spending Christmas in New York with our Manhattan-based family. And what a treasure trove the book proves to be. New Yorkers are famously demanding about food, they want the highest quality possible and will travel all over the city to seek it out. Well their mission just got a whole lot easier with the publication of this book. Susan Meisel is a born and bred New Yorker who previously ran her own catering company where she built up longstanding close relationships with food stores all over town. Nathale Sann is a native of Paris but has lived in New York many years and today New Yorkers seek her advice of where to shop for food. 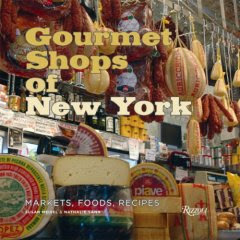 Together they have produced a fine but practical book that reflects their shared passion for good food and a lively curiosity about New York and its people. Together they provide an insider’s guide to almost 200 oif the best-loved and most-visited culinary outlets from right across New York’s five boroughs although unsurprisingly the great majority are Manhattan addresses. And the hundreds of mouth-watering colour photographs are a feature of the book. A quick skim of the list of outlets covered, (the authors provide a great address index and an index of shops by category), suggests we only know a dozen or so of them so there is plenty of scope for some serious exploring of that great city.